We were excited when we got the tip on these guys - thanks Josh! 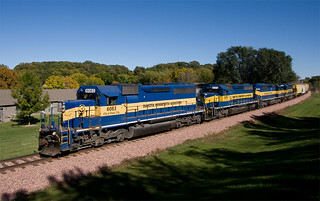 A four pack of blue and gold DME/ICE SD40-2's head west through St. Charles, MN on train 277. This image is featured in the 2015 Minnesota Rails calendar.